Donald William Kerst was Emeritus Professor of Physics at the University of Wisconsin, Madison (1962-1993). Other institutional affiliations included General Atomics and the University of Illinois, Urbana-Champaign. His research interests included particle accelerators and betatrons. November 1, 1911Birth, Galena (Ill.). 1934Obtained BA, University of Wisconsin, Madison, Madison (Wis.). 1937Obtained PhD in Physics, University of Wisconsin, Madison, Madison (Wis.). 1937 – 1938X-ray tube developer, General Electric X-Ray Corporation. 1938 – 1957Instructor to Professor of Physics, University of Illinois, Urbana-Champaign, Urbana (Ill.). 1940 – 1941Physicist, Research Laboratory, General Electric Company. 1943 – 1945Physicist and Group Leader, Manhattan Project, Los Alamos Laboratory. 1953 – 1957Technical Director, Midwestern University Research Association. 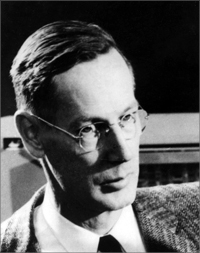 1957 – 1962Researcher, John Jay Hopkins Laboratory for Pure and Applied Science, General Atomics, San Diego (Calif.). 1962 – 1993E. M. Terry Professor of Physics (1962-1980) and Emeritus Professor of Physics (1980-1993), University of Wisconsin, Madison, Madison (Wis.). 1984Awarded James Clerk Maxwell Prize for Plasma Physics, American Physical Society. 1988Awarded Robert R. Wilson Prize for Achievement in the Physics of Particle Accelerators, American Physical Society. August 19, 1993Death, Madison (Wis.). Collaborated on early development of the betatron. Both employed at University of Illinois, Urbana-Champaign. Both employed at General Atomics. Researcher, John Jay Hopkins Laboratory for Pure and Applied Science. Leader, Water Boiler Group, Manhattan Project. Leader, Water Boiler Group, Los Alamos Laboratory. Obtained BA (1934) and PhD in Physics (1937). E. M. Terry Professor of Physics and Emeritus Professor of Physics. Received 1984 James Clerk Maxwell Prize for Plasma Physics and 1988 Robert R. Wilson Prize for Achievement in the Physics of Particle Accelerators. Donald W. Kerst papers, 1945-1981. Letter to William J. Hamm concerning donation of betatron to the Smithsonian Institution, 1985. Symposium in honor of D. W. Kerst [sound recording] : high energy radiation therapy: past, present and future / Sponsored by the University of Wisconsin, North Central Chapter of AAPM, and the Midwest Chapter of AAPM; 1978 June 2. University of Illinois at Urbana-Champaign Physics Research Laboratory betatron files, 1941-1990. Their Family Story: Bill and Becky Koch, July 2002. Donald Kerst Physics Today obituary.